Word has been received with the passing of Delta Golden Wings member retired Delta pilot Captain John Ross Sellmer, age 76. 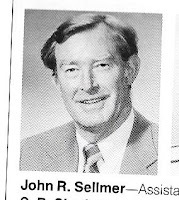 Captain Sellmer joined Delta Air Lines 06-02-1969 and was based Atlanta. Widowed in November 2015 with the passing of his wife Linda, Captain Sellmer is survived by their children, many dear friends and other family members. We understand that Mowell Funeral Home has been entrusted with arrangements. The Sellmers had resided at 128 Sea Island Dr, Peachtree City, GA 30269. For more information and to RSVP, please contact the family at 770-630-9080. Our good friend John Sellmer passed on Thursday, August 24. He was in Delta class 69-E starting 02Jun69. Below is the planned celebration of life! There will be a celebration of life on September 23, 2017 at the Dixie Wing hanger at Falcon Field (KFFC). Time will be 1400-1800. Linda S. Sellmer of Peachtree City passed away on November 3, 2015 at the age of 74. She was born in Washington, D.C. to Monty and Mary Schumacher on October 31, 1941. City; and her brother, Paul M. Schumacher of Atlanta.